A debate is raging between proponents of traditional, text-based computer adventure games and the new graphics adventure games. Welcome to the ultimate adventure: A titanic struggle is underway for your attention and your money. At stake, the fate of major software companies and the careers of computer programmers. What will you choose: Text or Graphics? A killer stalks Hampstead Manor. You are confronted in the Troll Room; your sword glows with a strange light. The people of Sosaria look to you to save them once again. The half-light of a dank dungeon corridor stretches before you. King Edward of Daventry lies dying; you are the last hope in all the land. What adventurer worth his steel could turn away from such challenges? Thousands of computer owners have already answered the call in scenarios like the ones above. And if you haven't yet ventured forth on any of these quests, the chances are good that you will sometime in the future. The scenes described represent a wide range of popular adventure games: Ripper (Micro­computer Games, division of Avalon Hill), an all-text adventure in which you track the infamous Jack the Ripper; ZORK 1: The Great Underground Empire (Infocom), the first installment in an immensely popular all-text series; Exodus: Ultima III (Origin Systems), a highly successful role-playing, graphics-and-text adventure series; Wizardry: Proving Grounds of the Mad Overlord (Sir-Tech), one of the most complex and popular text-and-minimal-graphics, fantasy role-playing games ever made; and King's Quest (Sierra), a breakthrough in graphics-oriented adventure games. These are but a few examples of what has become a major genre in computer games. Other companies with adventure game products include Adventure International, Black Knight Industries, Electronic Arts, Epyx, FTL Games, Harper and Row, Muse, Pryority Software, Screenplay, Strategic Simulations, Inc., and Sunrise Software. Although these games are usually lumped together as computer adventure games, the differences often outweigh the similarities. Such programs attempt to engage the player in solving puzzles, exploring new worlds, and trying on new identities. While arcade-style action games reward a sense of quick-reflex timing, superior hand-eye coordination, and visual perception, adventure games usually require patience, intelligence, curiosity, imagination, and the capacity to immerse yourself temporarily in another world—a willing suspension of disbelief. Beyond these characteristics there are differences which attract some players. Does the adventure game have only text, omitting colorful graphics completely? Is there a balance between text and graphics? Or, finally, do graphic images actually carry the game itself, leaving text in a subservient role or completely absent? What do these differences mean to adventure game players? "The fact of the matter is that whenever you put graphics into a program, you've got to take something out because you've only got a limited amount of space on the diskette," says Robert Woodhead, coauthor of Sir-Tech's Wizardry, one of the all time best-selling games for Apple II computers. 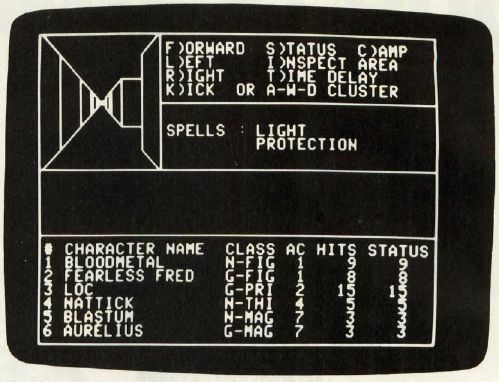 In Sir-tech's Wizardry, a three-dimensional maze outline appears onscreen alongside status and command text information. "And individual consumers have to decide. Generally, they like both," he adds. "In a program like Wizardry, we decided that we wanted a lot of content, but that we could put in a little graphics. And the graphics are of a special form—maze plotting. Because the [memory] resources required to do that are not incredibly huge, it works out very well. It conveys the desired information and it's sufficiently sparse so that people embellish it in their own minds. It reaches a little bit of a happy medium." The "happy medium" Woodhead and coauthor Andrew Greenberg sought with Wizardry obviously worked. To date, they have shipped over 200,000 copies of the complex fantasy role-playing game. And out of the thousands of letters they've received from players, Woodhead says that only a half-dozen have been negative. From one to six players may take part, and a total of 50 different magical spells can be cast. The game takes a minimum of 70 hours to complete as you and your compatriots wander through a ten-level, 3-D mazelike dungeon fighting monsters, finding treasure, and seeking clues to the game's puzzles. As with almost all adventures, games can be saved to disk since time requirements for each program are lengthy. So complex and rich an imaginary world is Wizardry that it has been used for everything from a catalyst in reading development to a therapeutic tool in the treatment of a suicidal youngster. Sir-Tech Software's next game, says Woodhead, will be an all-text adventure called The Mines of Qyntarr, in the tradition of the original ZORK created by Infocom. "It's an extremely complex and involved adventure game. And the major effort we're making right now is to make it a lot more user-friendly in terms of its command parser. [See "The Parser's Tale" in this issue.] I hope to get a command parser running that understands more complex grammar than ZORK," adds Woodhead. In speaking with programmers and designers of adventure games, the name Infocom almost invariably comes into the conversation. It's widely acknowledged that the Cambridge, Massachusetts, based company is the uncontested leader in the production of sophisticated, all-text adventure games. Infocom's adventures are considered the standard for quality in all-text formats. Here, on the Macintosh, a pull-down menu can be seen in the upper left corner. ZORK, for example, has a com­mand parser vocabulary in excess of 600 words, allowing significant variety in the kinds of sentences that the game can understand. 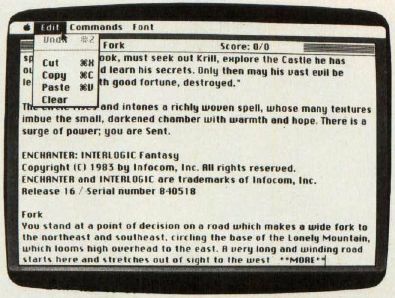 Infocom's new release, Sorcerer, a sequel to another Infocom game, Enchanter, has a vocabulary in excess of a thousand words. Infocom has spent its time and efforts developing the plot, the writing, the puzzles, and the parsing rather than on sound and graphics—the latter two of which Infocom vice president and master programmer Marc Blank calls "bells and whistles." And the results have demonstrated the popularity of well-done all-text games. The ZORK series, which Blank coauthored, has already well surpassed the quarter million mark in number of disks sold. A now-defunct ZORK User Group (ZUG) boasted more than 20,000 members nationwide. ZORK T-Shirts, bumper stickers, posters, and special clue books have all flourished. Infocom’s games are available in versions for most personal computers. When game historians give credit for the development and the legitimization of the term interactive fiction as applied to a certain type of computer adventure game, it will be Infocom which will get the laurels. But what about the future of all-text adventure games as computers become powerful enough to have sophisticated parsers and colorful graphics all at the same time? "For the next year or so there'll still be a market for the incredibly well-done text adventures," says Richard Garriott, coauthor of Origin Systems' Ultima series of fantasy role-playing games, available for Apple, Atari, and Commodore machines. "Anybody other than the Infocom style cannot succeed at this point. Infocom has put together a very, very sophisticated parser, and the non-player characters within the game actually have some intelligence to their movements. "I really think that as we develop better computer systems that surely this same kind of technique—if not the quality that Infocom is putting into their games—can also then have the added feature of the realtime graphics and animation put on top as well," he says. "The standard argument is that the game with graphics is like going to see the movie and the game with text is like reading the book," adds Garriott. "Some people will still have some preference between the two. But the vast majority of the marketed products will almost have to turn to graphics because of the demand of the public." Origin Systems' Exodus: Ultima III offers graphic images of the game at left while game information is displayed at right. Garriott, 23, has been writing computer fantasy-adventure games since his sophomore year in high school. He completed 28 fantasy games while still in high school, learning more about the genre with each attempt. Origin Systems' Ultima fantasy role-playing series is a testament to the strength of Garriott's game-designing talents. "The key to the Ultima series is really just the way the role-playing gives the player a great deal of freedom with what his options are at any point in the game," says Garriott. "It's basically a game in which you're living out your life. And you can do anything you want." Are You Man Or Fuzzy? In Exodus, the third game in the Ultima series, evil again walks the land of Sosaria. Will you confront this evil as Human, Elf, Dwarf, Bobbit, or Fuzzy? Now determine your strength, dexterity, intelligence, and wisdom. Choose your profession from among about a dozen possible types ranging from Cleric to Thief. Then, with a band of co-horts, go forth. But be quick about it: Ultima IV is already well along in development. 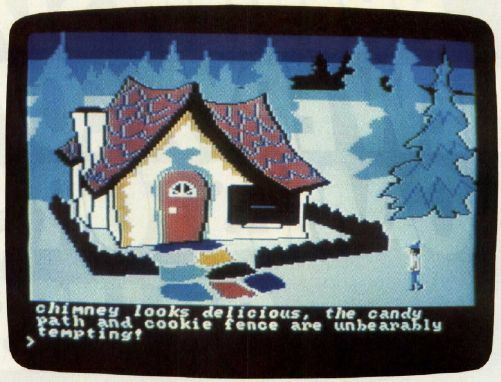 Quite a different approach has been taken—and very successfully—by Sierra in its graphic adventure game, King's Quest, for the IBM PC and PCjr. Requiring 128K of memory and the use of a color monitor, the adventure game actually lets you control the movements of an onscreen knight, Sir Grahame, as he moves about the colorful kingdom of Daventry. The movement is smooth, the screens are redrawn rapidly, and Sir Grahame is seen walking in front of, behind, and even between objects. He climbs, jumps, ducks, swims, and can be warned of impending danger by sound effects. The command parser for such a game is necessarily much smaller than that used in an Infocom game, but the play requirements are not based on having a huge volume of words. There are helpful fairies, elves, condors, and a god­mother. But there are also unfriendly sorcerers, dwarfs, ogres, wolves, and an airborne witch. Roberta Williams, who designed King's Quest for Sierra, admits that the game represents a big change from what has been done with computer adventure games in the past. "There's nothing like it," she says. "It's innovative." Sierra's King's Quest, for the PC and PCjr with 128K, offers the best quality graphics in an adventure thus far. The interaction between the text and the onscreen graphics is clearly the way many future adventure games will be constructed. One element complements the other. For example, as Sir Grahame stands before King Edward, type in the words BOW TO THE KING. As you hit the RETURN key, Sir Grahame can be seen bowing and doffing his cap. And, Williams adds, subtle clues can be built visually into the game that an all-text adventure couldn't have. When Sir Grahame stumbles upon the house of a poor woodcutter and his wife, the screen shows an old and pitifully thin couple in a rundown house. The room is bare of food, a subtle clue to the player that an offering of something to eat might be very much appreciated by this mysterious couple. While King's Quest uses text to supplement its high-quality graphics in the adventure, such action-adventure games as Electronic Arts' Seven Cities of Gold, Epyx's Temple of Apshai, and Muse's Castle Wolfenstein offer a range of adventure and strategy combinations primarily without text. The gradations in type of game play—as well as quality of play—being offered to computer owners today are already staggering in number. There is, it seems, something for just about anyone. The tradeoff which programmers and game designers now must make because of computer memory limitations will not always be a problem, notes Dave Albert, executive vice president of Penguin Software. Penguin has released such adventures and fantasy role-playing games as Transylvania (Apple II, Macintosh, Atari, Commodore 64), The Coveted Mirror (Apple II family), and Expedition Amazon (Commodore 64). "In order to have the graphic images, you have to cut back on the amount of text. But that's becoming less of a reality, both through text compaction methods and because all of a sudden 128K seems to be starting to become a standard. And pretty soon, 512K will become a standard, and then it will become irrelevant," says Albert. Penguin's newest fantasy role-playing game is Xyphus for the Apple II. Players may create characters who continue through different scenarios. The game also offers four-player independent movement, a variety of magical spells, and a mixture of graphics with text that reveals information about the status of the game. Agreeing with Albert is Mike Cullum, new product director for Avalon Hill's Microcomputer Games division: "We've just released an all-text adventure game, Ripper, for the Commodore 64. Personally, I like the text games," he says. "But we have found that the averate consumer wants the pictures." "As machines grow with more and more memory and sophistication, there won't be any excuse [not to have graphics]," he says. 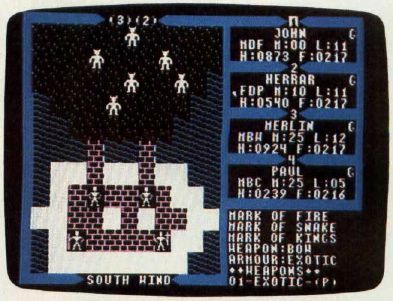 One very popular game for Avalon Hill has been its all-text adventure Empire of the OverMind, for Apple II and Atari computers, which is still selling well, notes Jack Dodd, Avalon Hill's director of marketing. But with another of their releases, Jupiter Mission 1999, for Atari and Commodore 64 computers, the company mixed graphics and text in a very complex adventure. "Of course, it took us four disks to do it," Dodd says with a laugh. "But it has all the meat of a text-type adventure." Penguin Software's Transylvania (at left) offers graphics alongside the text, here on the Macintosh version. Xyphus (at right), also from Penguin, is a graphics-based fantasy role-playing game for the Apple II computers. One of the most recent trends in the computer adventure genre is the use of well-known writers and the conversion of popular books into computer-game formats. No one is so far doing this more aggressively than Spinnaker Software's Trillium line of adventure games. Spinnaker's Trillium adventure-game series offers graphics and text as shown from two of its titles, Dragonworld (at left) and Rendezvous With Rama (at right). "We're trying to make a game that is based on plot and characterization—the way a book is—not puzzles," says Seth Godin, Trillium product manager. The Trillium series, which uses graphics and text, seeks to minimize the frustration factor, which has turned many would-be adventurers away from some computer games, adds Godin. To help achieve this, each of the games focuses on plot and characterization more than puzzles, and also includes a hint book and a list of the words that the game understands. "If you read Fahrenheit 451, you don't get stuck on page 50. And if you play the game, you don't get stuck on frame 50, because the whole idea is that you're interested in the game because of the characters and the plot and what's happening," he says. In addition to Ray Bradbury's Fahrenheit 451, the Trillium line will initially consist of adventure games based on such popular books as Arthur C. Clarke's Rendezvous With Rama, Michael Crichton's Amazon, Byron Preiss and Michael Reeves's Dragonworld, and Robert A. Heinlein's Starman Jones. One of the games, Shadowkeep, actually preceded the book, which was later written by Alan Dean Foster, author of Alien and the Spellsinger series. The games are expected to be in stores by the end of September or the first of October for the Commodore 64 and the Apple II line. Later conversions will follow. Although some adventure-game companies privately complain that signing a big-name author doesn't necessarily mean a first-rate game, Godin believes Spin­naker has found a good combination of talent and procedure. "In every case, we worked with the authors to create the world [of the book] again," he says. "In the case of Dragon-world and Amazon, Byron Preiss and Michael Crichton wrote every word of the game. In the case of Fahrenheit 451 and Rendezvous With Rama, we worked with the authors on the editings and the way it worked. We didn't just buy their names." All of the games use graphics with text, and allow interaction between the two. For example, as Amazon opens, a research station somewhere along the Amazon River has obviously been attacked. Suddenly, as your mock video transmission fades, you briefly glimpse an intruder. To find out what's happened and who the intruder is, you must travel to the Amazon and explore. As microcomputers continue to grow more powerful, a generation of avid adventure-game designers and programmers is growing more sophisticated. And, while the debate over text versus graphics will surely continue, there is a fundamental enthusiasm shared by all the best adventure-game producers. This enthusiasm is the key, they all admit, to the continuing improvement of computer-based adventures. As Robert Woodhead says of his Wizardry game: "It's a good game that was a labor of love, and we didn't write it for anyone else but ourselves. People appreciate that."